edges, high visibility yellow and integrated guardrails.  Two integrated handles for easy handling.  Powder coated steel legs for durability and strength.  4" height differential capability.  750 lb. load capacity. 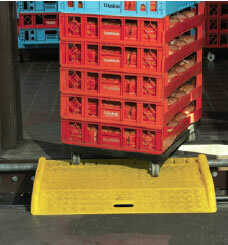  Lift-n-lower ergonomic design helps reduce injuries and comp claims.  Features molded-in handle, raised non-slip surface, and integrated side rails.  Coated steel installation kit installs easily on metal or concrete dock facing. 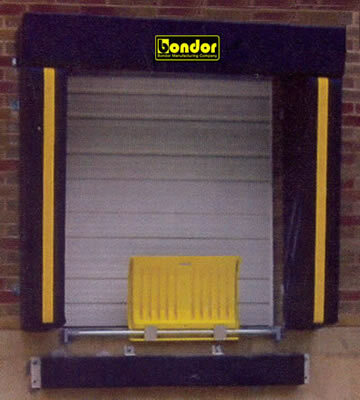  6' slide bar for easy truck centering or out-of-the-way storage.  1,000 lb. load capacity. 35" x 36" x 5"